The first deal limiting greenhouse gases from international aviation has been sealed after years of wrangling. From 2020, any increase in airline CO2 emissions will be offset by activities like tree planting, which soak up CO2. The deal comes in a momentous week for climate policy when the Paris agreement to stabilise climate change passed a key threshold for becoming law. Scientists applauded both commitments, but warned that plans to cut emissions are far too weak. The aviation deal was agreed in Montreal by national representatives at the International Civil Aviation Organisation, ICAO. Attempts have been made for nearly two decades to include aviation and shipping in the UN's climate agreements, but both sectors have managed to avoid firm targets. The amount of emissions from aviation worldwide are roughly the same as those produced by the whole of Germany - and they are growing fast. They are projected to consume approximately a quarter of the world's remaining carbon budget by 2050. ICAO previously promised carbon neutral aviation growth in the 2020s, and planned to align the ambitions of airlines with the Paris agreement limiting warming to two degrees Celsius, or preferably 1.5 degrees. At the last minute in Montreal, those plans were either watered down or dropped. Instead a compromise was agreed. CO2 will be allowed to grow to 2020 but after that, emissions will need to be offset. The deal will be voluntary to 2026 but most major nations are expected to take part. Britain's Aviation Minister Lord Ahmad said: "This is an unprecedented deal, the first of its kind for any sector. International aviation is responsible for putting more carbon dioxide into the atmosphere every year than the whole of the UK, and yet until now, there has been no global consensus on how to address aviation emissions. "For years, the UK has pushed to tackle emissions globally. 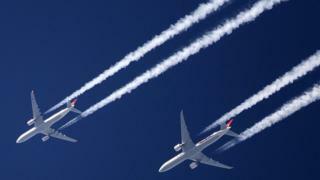 Now, 191 countries have sent a clear message that aviation will play its part in combating climate change." Tim Alderslade from the British Air Transport Association also welcomed the deal. He told BBC News: "It should not be forgotten that we are the only industry that has voluntarily agreed to such a commitment. "As a sector we have really decoupled growth in aviation from growth in emissions." Bill Hemmings from the green group T&E said: "Airline claims that flying will now be green are a myth. Taking a plane is the fastest and cheapest way to fry the planet and this deal won't reduce demand for jet fuel one drop." The offsetting proposal is especially controversial. Airlines are striving to make planes more efficient, but the industry can't innovate fast enough to contain its dynamic growth. That led to the proposal for offsetting - but sometimes offsetting by planting woodlands simply duplicates efforts already being made, and the offsetting industry is said to be prone to double-counting. What's more, the ICAO deal has no clear rules for offsetting. Tim Johnson from Aviation Environment Federation warned that to meet its own ambitions, the UK needed to go much further than the ICAO agreement. He told BBC News: "With a decision on a new runway expected later this month, the UK's ambition for aviation emissions must match the ambition of the (UK's) Climate Change Act, and not simply the ICAO "global lowest common denominator" of "carbon neutral growth from 2020.